Juan José Begué Lezaun – Blog De Las Sombras. Mirror. El martes 25 de noviembre de 2014, el fiscal jefe de Lugo, D. Juan José Begué Lezaun, apareció muerto en su domicilio en Culleredo (La Coruña). No se han hecho públicas las causas del fallecimiento, que según la Fiscalía General de Galicia están siendo investigadas por el juez y el forense que se ocupan del caso, aunque se ha descartado una acción violenta o la participación de terceras personas. 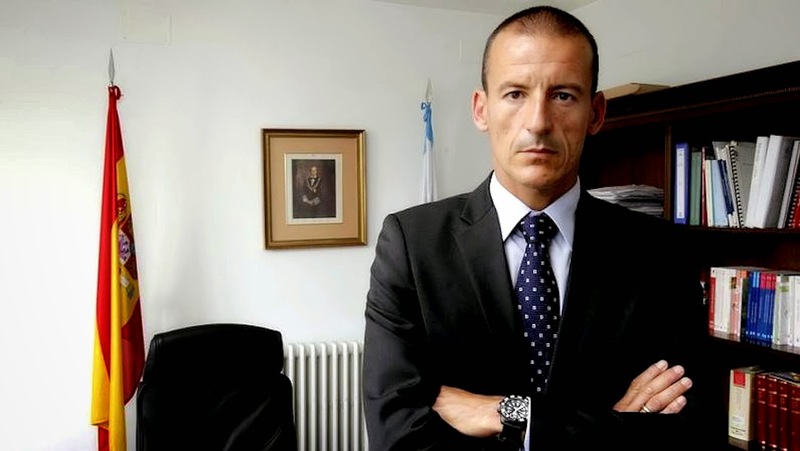 Juan José Begué Lezaun, de 44 años, casado y padre de una hija, fue nombrado fiscal jefe de Lugo el 24 de julio de 2013, sustituyendo a Javier Rey. Había nacido en Huesca en 1970, iniciando su carrera en Gerona, en el año 1997, como fiscal responsable del Servicio de Jurados de la Fiscalía de la Audiencia Provincial, recibiendo la medalla de bronce al mérito policial con distintivo azul. En 2008 se incorporó a la Fiscalía Provincial de A Coruña, hasta su traslado a Lugo. Al tomar posesión, Begué Lezaun prometió trabajo y más trabajo, ya que se había observado una disminución de la delincuencia en la provincia de Lugo, pero había aumentado el retraso de las causas pendientes. Asimismo manifestó su concepto de la Fiscalía como servicio público. 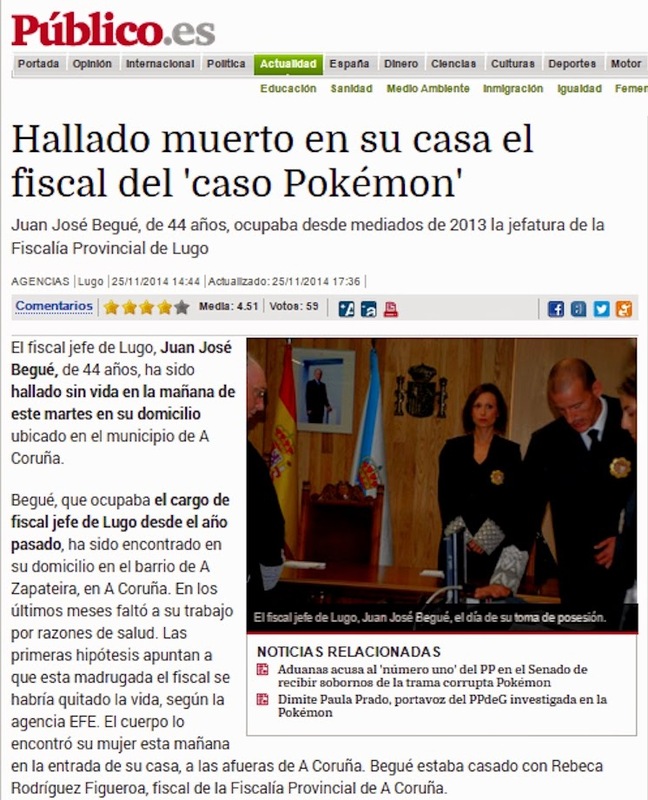 Se estaba ocupando del caso Pokemon, la operación Carioca y el juicio del violador del estilete. El cadáver fue encontrado por la esposa de Begué, Rebeca Rodríguez Figueroa, fiscal de la Fiscalía Provincial de A Coruña, en su domicilio del barrio de La Zapateira. 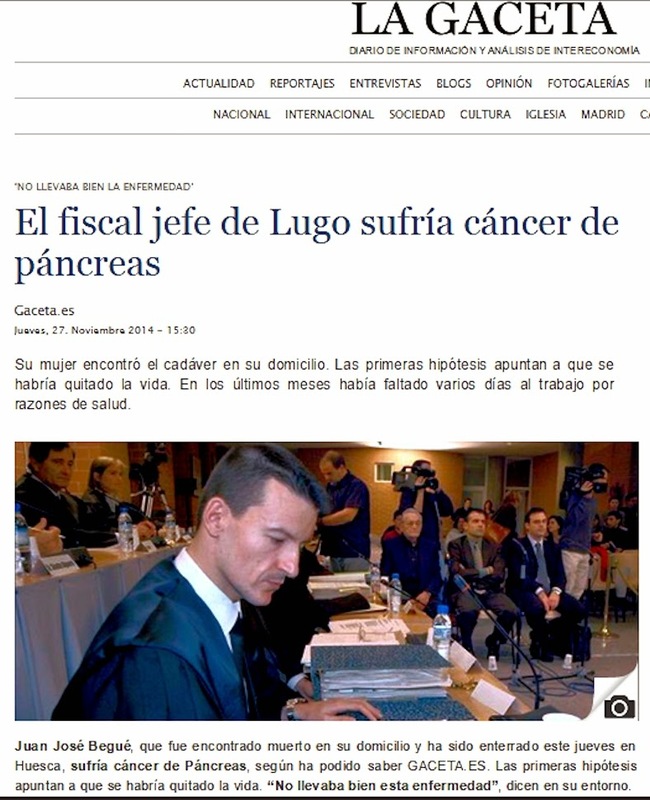 La prensa filtró -en lo que parecía una justificación a priori de un posible suicidio- que el fiscal Begué llevaba tiempo tratándose de depresión. Tanto “El Faro de Vigo” como “La Voz de Galicia”, dos diarios gallegos, informaban que todo apuntaba a un suicidio, según fuentes del caso. El Fiscal Superior de Galicia, Carlos Varela, declaró que el colectivo de fiscales de la Comunidad Autónoma, “lamenta a sensible perda deste destacado compañeiro, do que salienta a súa gran valía profesional e humana“. ¿Cómo conseguimos que encaje la noticia de arriba, en la que se indica que la mujer de Begué, Rebeca Rodríguez, encontró el cadáver de su marido “en la entrada de su casa” con ésta de abajo, en la que se insinúa que Begué se quitó la vida “porque padecía un cáncer de páncreas” y no lo llevaba bien. ¿Quién se suicida a la puerta de su casa? ¿Cuántos fiscales se han suicidado en los últimos 35 años? ¿Primero depresión, luego cáncer de páncreas? ¿Depresión a consecuencia de su enfermedad? Hay mucho que aclarar, y los ciudadanos se merecen una buena explicación. ¿Realmente se suicidó Begué? ¿Cómo lo hizo? Si fue con un arma de fuego, ¿tenía permiso de armas? ¿Apareció el arma junto a su cuerpo? ¿Se hizo un estudio balístico para comprobar qué arma disparó el proyectil? Operación Carioca, Operación Pokémon, Caso Campeón. ¿Qué va a pasar ahora con estos tres casos? I. What the Method of Making Laws Should Be. We, whose duty it is to afford suitable assistance in the formation of the laws, should, in the execution of this undertaking, improve upon the methods of the ancients, disclosing as well the excellence of the law to be framed, as the skill of its artificer. The proof of this art will be the more plainly evident, if it seems to draw its conclusions not from inference and imitation but from truth. Nor should it stamp the force of argument with the subtlety of syllogism, but it should,  with moderation, and by the use of pure and honorable precepts, determine the provisions of the law. And, indeed, reason plainly demands that the work be performed in this manner. For, when the master holds in his hand the finished product, in vain is sought the reason for its having been impressed with that particular form. On subjects that are obscure, reason eagerly seeks to be informed by examination, in matters, however, that are well known and established, action alone is required. Therefore, when the matter in question is not clear because its form is unfamiliar, investigation is desirable; but it is otherwise in affairs known to all men, where not speculation, but performance, becomes essential. As we are more concerned with morals than with eloquence, it is not our province to introduce the personality of the orator, but to define the rights of the governor. II. How the Lawmaker Should Act. The maker of laws should not practise disputation, but should administer justice. Nor is it fitting that he should appear to have framed the law by contention, but in an orderly manner. For the transaction of public affairs does not demand, as a reward of his labors, the clamor of theatrical applause, but the law destined for the salvation of the people. III. What Should be Required of the Lawmaker. First, it should be required that he make diligent inquiry as to the soundness of his opinions. Then, it should be evident that he has acted not for private gain but for the benefit of the people; so that it may conclusively appear that the law has not been made for any private or personal advantage, but for the protection and profit of the whole body of citizens. IV. What the Conduct of the Lawmaker Should Be in his Daily Life. The framer of laws and the dispenser of justice should prefer morals to eloquence, that his speech may be characterized rather by virtuous sentiments, than by elegance of expression. He should be more eminent for deeds than for  words; and should discharge his duties rather with alacrity than with reluctance, and not, as it were, under compulsion. V. How the Lawmaker Should Impart Advice. He should be mindful of his duty only to God and to himself; be liberal of counsel to persons of high and low degree, and easy of access to the citizens and common people; so that, as the guardian of the public safety, exercising the government by universal consent, he may not, for personal motives, abuse the privileges of his judicial office. VI. What Manner of Speech the Lawmaker Should Use. He should be energetic and clear of speech, certain in opinion; ready in weighing evidence, so that whatever proceeds from the source of the law may at once impress all hearers that it is characterized by neither doubt nor perplexity. VII. How the Lawmaker Should Act in Rendering Judgement. The Judge should be quick of perception; firm of purpose, clear in judgment, lenient in the infliction of penalties; assiduous in the practice of mercy; expeditious in the vindication of the innocent: clement in his treatment of criminals; careful of the rights of the stranger; gentle toward his countrymen. He should be no respecter of persons, and should avoid all appearance of partiality. VIII. How the Lawmaker Should Comport Himself in Private and Public Affairs. All public matters he should approach with patriotism and reverence; those concerning private individuals and domestic  controversies he should determine according to his authority and power; so that the community may look up to him as a father, and the lower orders of the people may regard him as a master and a lord. He should be assiduous in the performance of his duties so that he may be feared by the commonalty to such a degree that none shall hesitate to obey him; and be so just that all would willingly sacrifice their lives in his service, from their attachment to his person and to his office. IX. What Instruction it is Fitting that the Lawmaker Should Give. Then, also, he should bear in mind that the glory and the majesty of the people consist in the proper interpretation of the laws, and in the manner of their administration. For, as the entire safety of the public depends upon the preservation of the law, he should attempt to amend the statutes of the country rather than the manners of the populace: and remember that there are some who, in controversies, apply the laws according to their will, and in pursuance of private advantage, to such an extent that what should be law to the public is to them private dishonor; so that, by perversion of the law, acts which are illegal are often perpetrated, which should obviously be abolished through the power of the law itself. 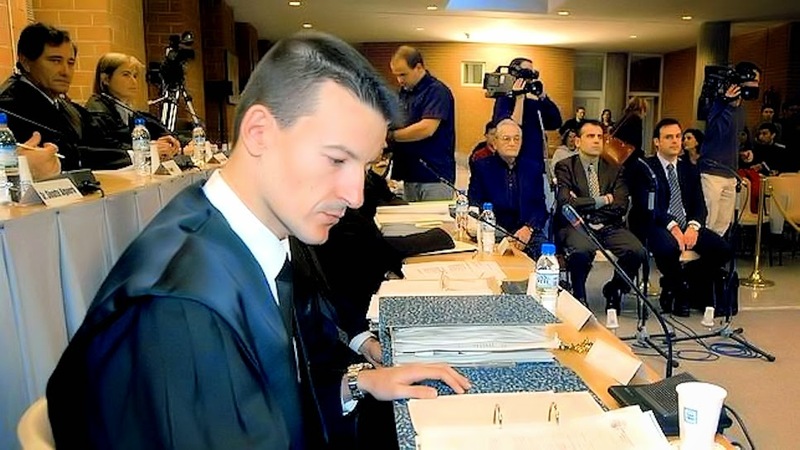 ← El triple crimen de Alcàsser. Vigésimo segundo aniversario. Me parece sorprendente que nadie se acuerde de la muerte de este Fiscal. Simplemente, se publicó su muerte y ya está. ¿Cuál ha sido el resultado de la autopsia?